Luffy’s impulsive attack on Gecko Moria ends up costing the rubber-man something he can’t live without - his shadow! When Zoro and Sanji find themselves in the same boat, the three fierce fighters must find a way to recapture what was lost, or face the possibility of death by sunlight. Luckily, their skeleton friend, Brook, knows the trick to defeating Moria’s zombie army, and he’ll gladly share the secret for a small price. Meanwhile, Nami narrowly avoids an undead trip down the aisle, and Zoro clashes with a zombie samurai in the hopes of adding a new blade to his arsenal. Armed with the secret to defeating Moria’s minions, things briefly appear to be looking up for the Straw Hats, but the onslaught of Oars, the towering terror powered by Luffy’s shadow, threatens to doom the crew. 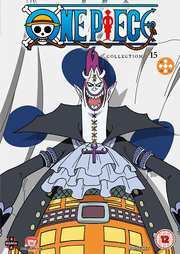 One Piece Collection 15 contains 349-372.